The artwork created this evening is offered for auction. All proceeds generously contributed to Luv Michael. Click here to participate. Amongst the architectural majesty of New York’s Freedom Tower, The Oculus Transportation Hub, and the jumble of construction projects yet to rise, an arts and music awakening was held April 3rd on the 10th floor of 7 World Trade Center for a private audience. The event, Le Revéil (The Awakening) is a musical and visual performance art experiment by artist Pierre Fraiture of Arts Elektra, his brother, Nikolai Fraiture, bassist of The Strokes and Summer Moon, and a diverse cast of performers. The gathering represented an eclectic convergence of New York’s downtown arts scene, the beauty and sentiment of the new World Trade Center complex, and the feeling of hope that accompanies the season. The organizers hope to benefit and bring attention to non-profit granola maker, Luv Michael, an innovator in education, empowerment and workplace training for young adults with autism. With a background in music and art dating back decades, as well as deep roots in NYC, Arts Elektra’s goal is to refocus awareness on the city’s vibrant and creative DIY scene, while meaningfully contributing to relevant organizations. Following a tale of spiritual awakening, each Act will exist independently as well as part of a greater volume entitled “C’est Le Moment Ou Jamais (It’s Now Or Never).” Arts Elektra’s objective is to perform each act at various International locations culminating in one all-encompassing grand finale. Le Revéil (The Awakening) marks the project’s maiden voyage. “The World Trade Center represents an ideal platform to help raise global Autism awareness. Performing with my brother Nikolai on such an international stage and for such a good cause is very exciting! We’ve known the founders of Luv Michael from the start and are delighted to watch the organization grow,” says Pierre Fraiture, a New York City native. And it is those Tribeca headquarters that will be a practical beneficiary of this event. Luv Michael, having secured a building on Tribeca’s Walker Street, is in the process of a capital campaign to renovate the space into a commercial kitchen and learning center. There, young adults with autism, known in the kitchen as “granologists,” learn how to be an employee and part of the workforce. They also learn kitchen and food safety, how to manufacture the granola and are prepped for their New York State Food Handlers License. Luv Michael is part of an increasing trend to employ young adults with special needs who usually lose educational services when they reach adulthood. With 60 Greater New York Area retailers carrying their granola, and JetBlue airlines set to carry their snacks on board U.S. flights, Luv Michael is ready to grow. 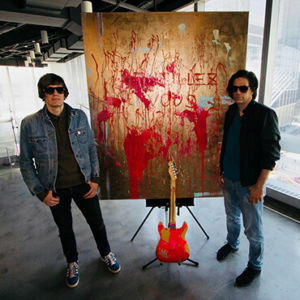 Arts Elektra is a performing arts and music experiment founded by New York City artist, Pierre Fraiture, and his brother, musician Nikolai Fraiture (The Strokes, Summer Moon). Using multiple methods of production, Nikolai and Pierre perform site-specific happenings as improvised “action collages” where music, art, dance, and film take shape in real time to create a fully realized environment derived from current cultural and creative assemblages. Luv Michael is a Non Profit 501c 3 organization that produces high quality organic, gluten-free, and nut-free granola without all the harmful chemicals and toxic allergens. The company was founded in 2015 by Lisa Liberatore, MD and her son Michael with the goal of providing meaningful employment and on the job training to those diagnosed with Autism.